During 1965-66, various alignments of European manufacturers studied different designs with the most promising being the HBN-100 developed by Hawker Siddeley, Breguet and Nord. On 28 May 1969, France and West Germany decided to go ahead with the development of the European Airbus, as it had become, with Hawker Siddeley involved despite the lack of government support. Construction of the A300 began in September 1969, and in December 1970 Airbus Industrie was established to oversee the project. The General Electric CF6 turbo-fan was chosen as the initial powerplant and the fuselage could accommodate seating layouts from 220 to a maximum of 336 passengers. The wing was a Hawker Siddeley design, with a full suite of high-lift devices. The 28 degree sweep wing incorporates supercritical features that delay the onset of shockwaves up to high sub-sonic speeds. The wing took nearly 4,000,000 man-hours and almost 4,000 hours of wind-tunnel tests to perfect. The wing skin panels, approximately 51 feet long, are milled by computer-guided machines and preformed in presses. The two engines can be General Electric CF6-50C or Pratt & Whitney JT9D-59A turbofans. The cockpit of A300 aircraft offer up a modernized approach to jetliner flight. The two-member crew that was introduced with the A300 series has become an industry standard arrangement. The cockpit is dominated by six CRT displays that provide real-time and crucial systems monitoring and work together to decrease pilot workload overall. The first of two A300B1 (F-WUAB), first flew on 28 October 1971, the second following on 5 February 1973. These were followed by the first pair of A300B2s, considered the production model. European certification was achieved in 549 hours and granted on 15 March 1974, US certification following on 30 May. Air France flew the first scheduled services of the Airbus, an A300B2, on 23 May 1974, and by mid-1978 production was speeding to four a month, with over 80 sales in the preceding 12 months. Airbus Industrie's long-range A300B4-100 entered service with the German charter airline Germanair on 1 June 1975, having been delivered on 23 May that year. A300B seating configurations can be varied from 345 passengers maxi-mum in charter layout, to a mixed passenger/freight, or all-cargo payload. With an extra centre section fuel tank, thicker wing roots and Kruger leading edge flaps for a sprightly takeoff at “hot and high” airports, and increased gross weight, the Airbus was converted from a short- to a medium-range airliner in the 1974 B4 version. Airbus Industrie flew the first example (F-WLGA) of the A300B4 on 26 December 1974. On 6 April 1978 Eastern Air Lines ordered the first of 38 A300s. These were the A300B4 variant. 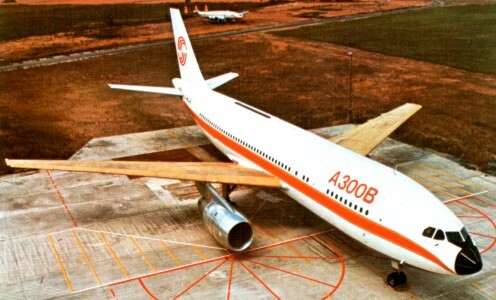 The last A300B4 was completed in late 1984. The A300C4 was introduced as a convertible freighter version with a cargo door in the port side. 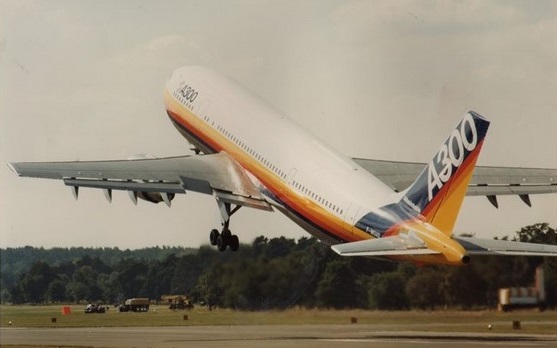 On July 8 1983 the first A300-600 took off for a 4hr 35min maiden test flight. Apart from checking -600 behaviour, initial checks were made on the specific fuel consumption of the new 56,000 lb-thrust Pratt & Whit-ney JT9D-7R4H, since this is the first time it has been eval-uated in flight. The 231-361 passenger A300-600 was delivered from 1984. The A300-600 incorporates an extra row of seats, a new two-man forward-facing cockpit and a number of small drag-reducing and weight-reducing items. Versions include the A300-600R with increased take-off weight and tailplane trim tank for long-range operations, and the A300-600 Convertible passenger/cargo version. After a total of 821 A300/A310s, Airbus delivered the last ever A300, a Freighter, to FedEx on 12 July 2007. At the time, FedEx had more than 120 A300 and A310s in service. Engines: 2 x Pratt & Whitney PW4156, 56,000lb thrust or CF6-80C2 turbofans, 61,500lbs thrust. A300-600ST Beluga - see seperate entry.